^ Gregory M. Lamb. Before computers, there were these humans.... Christian Science Monitor. 2005-07-05 [2014-12-03]. （原始内容存档于2014-11-05） （英语）. ^ Nina Byers, Gary Williams. Out of Shadows: Contributions of Twentieth-century Women to Physics. Cambridge University Press. 2006: 62. ISBN 0-521-82197-5 （英语）. ^ Liza Gross. Looking at the Sky Through a Glass Ceiling: Women in Astronomy. [2014-12-03]. （原始内容存档于2015-03-12） （英语）. ^ Edward C. Pickering,. Leavitt Node. HARVARD COLLEGE OBSERVATORY. [2015-03-13]. （原始内容存档于2015-04-02） （英语）. ^ Kerri Malatesta. Delta Cephei. American Association of Variable Star Observers. 2010-07-16 （英语）. ^ Fernie, J.D. The Period-Luminosity Relation: A Historical Review. Publications of the Astronomical Society of the Pacific. 1969-12-01, 81 (483): 707 [2015-03-12]. Bibcode:1969PASP...81..707F. doi:10.1086/128847 （英语）. ^ 12.0 12.1 David H. Clark; Matthew D.H. Clark. Measuring the Cosmos: How Scientists Discovered the Dimensions of the Universe. Rutgers University Press. 2004. ISBN 0-8135-3404-6 （英语）. ^ Ventrudo, Brian. Mile Markers to the Galaxies. One-Minute Astronomer. 2009-11-19 [2015-03-12]. （原始内容存档于2015-03-12）. ^ Singh, Simon. Big Bang: The Origin of the Universe. HarperCollins. 2005. ISBN 0-00-716221-9 （英语）. ^ FAQ. NobelPrize.org. [2015-03-12]. （原始内容存档于2015-03-12） （英语）. No, it is not possible to nominate someone for a posthumous Nobel Prize. ^ 16.0 16.1 Hamblin, Jacob Darwin. Science in the early twentieth century: an encyclopedia. ABC-CLIO. 2005: 181–184. ISBN 1-85109-665-5 （英语）. ^ Lutz D. Schmadel. Dictionary of Minor Planet Names. Springer Science & Business Media. 2012: 437. ISBN 9783642297182 （英语）. Lorenzen, Michael (1997). "Henrietta Swan Leavitt", in Notable Women in the Physical Sciences: A Biographical Dictionary. Edited by Barbara and Benjamin Shearer. Westport, CT: Greenwood Press, 233–237. ISBN 978-0-313-29303-0. 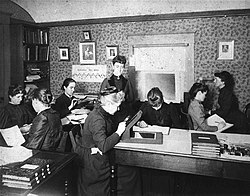 Women in Astronomy: An Introductory Resource Guide to Materials in English. Astronomical Society of the Pacific. [2011-08-08]. （原始内容存档于2011-08-08）. Jackie Stewart. 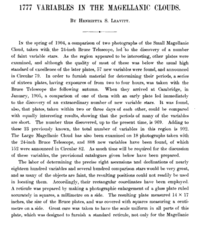 Henrietta Swan Leavitt: a Star of the Brightest Magnitude. [2013-06-04]. （原始内容存档于2013-06-04）. Tim Hunter. Henrietta Swan Leavitt. The Grasslands Observatory. [2012-03-09]. （原始内容存档于2012-03-09）.